Quadrangular Elizabethan orphan hospital complex comprising 2-storey ranges between 4-storey square-plan corner towers with angle turrets; additional, central tower to front elevation; octagonal turrets to centre of courtyard elevations; chapel projecting to centre of rear elevation; balustrades and flights of steps to terraces at S, E and W elevations; pair of lodges to West Coates, with boundary wall, piers, railings, gate piers and gates to street. Coursed, polished sandstone ashlar (Binny stone from Bathgate) with polished dressings. Base course; corniced string course between each floor; band of rosettes beneath heavily-projecting cornice; buckle quoins to all exterior angle turrets; window jambs chamfered throughout. Small-pane timber sash and case glazing throughout. Grey slate roof; tall octagonal cans with bevelled faces, heavily moulded at top; cast-iron rainwater goods to rear elevation and to courtyard ranges. Donaldson's Hospital was the bequest of James Donaldson Esq. of Broughton Hall. In his Will it was stated that: "I leave all my property, heritable and personal, .. to build and found an Hospital for Boys and Girls, to be called Donaldson's Hospital", it was to follow "the plan of the Orphan Hospital and George Watson's Hospital". The school was to be co-educational, admitting 200 boys, who would be trained as "traders", and 200 girls, to be trained as "house servants". When Donaldson died, on 19th October 1830, he left a sum of '210,000 for the School's Trust. Immediately, William Burn approached the Trustees to convey his interest in the project and to remind them of his credentials. 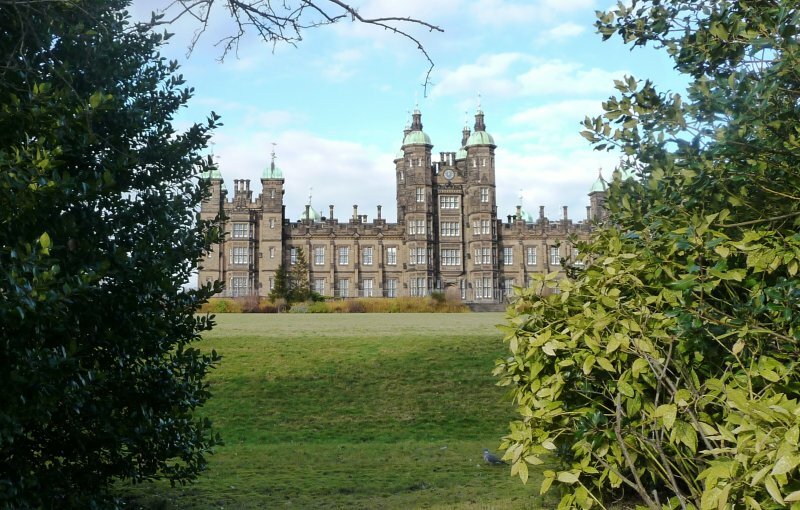 However, the Trustees decided to hold a competition for the job and invited William Henry Playfair, Thomas Hamilton and James Gillespie Graham to make designs. This initial invitation was sent on 19th November 1833 but it was not until 31 July 1838 that Playfair was declared the winner; he had submitted a total of 7 different designs to the Trustess. The contractors for the job were Young and Trench, they began their work on site in 1842. The work progressed very slowly, and in 1850 it was opened by Queen Victoria, who was impressed by what she saw. Cockburn described her visit, recording: "The Queen went over his [Playfair's] hospital ... admiring everything". It has even been rumoured that so impressed were Victoria and Albert that they suggested exchanging Holyrood Palace for Donaldson's Hospital. Indeed, R L Stevenson noted that "it has more the appearance of a Royal palace than a building for the reception of children...whose parents are in the humbler walks of life". 9 years after building work had begun, and almost 20 years since the architectural competition, the school was finally able to admit its first pupils in 1851. November 2010: The Scotsman reports a hotel chain, Intercontinental, is thought to be considering purchasing the site for conversion to a luxury hotel. The article notes the former school has been vacant for three years, following the relocation of the institution to West Lothian. Cala Homes had planned to convert the property to residential use including a new build element. However, following the economic downturn, the scheme is not thought to be proceeding any longer. For Investigation. April 2011: Edinburgh Evening News reports the building is being placed on the open market as Cala will no longer be developing the site into flats. November 2011: Limited external inspection finds the former school remains vacant, and has been so since at least 2008. 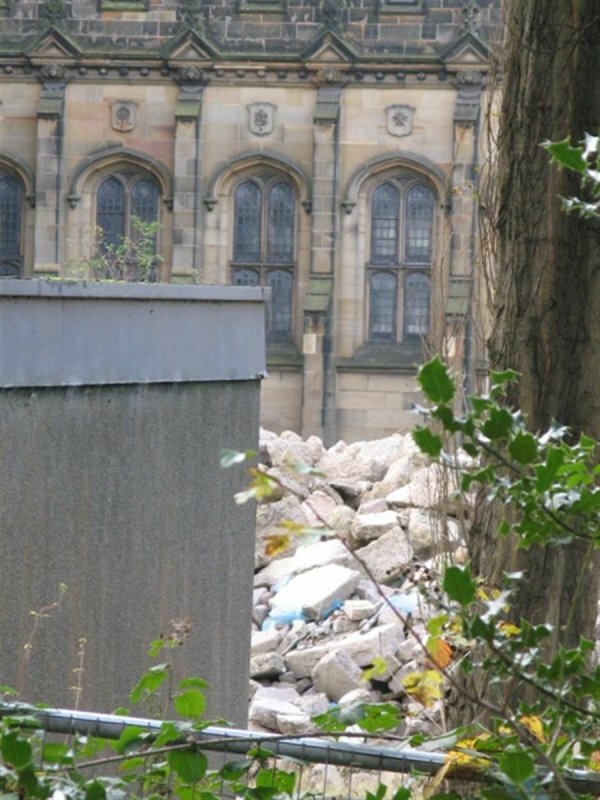 To the rear are piles of rubble remaining from the demolition of post-1945 buildings. The overall site is being marketed with permissions for conversion to 49 apartments, construction of new build crescent to the rear and re-use of the 2 associated lodges. The particulars note that the site may also lend itself to conversion to hotel use. Moved to At Risk. 9 October 2013: Frank Ross, economy convenor at Edinburgh City Council, outlines in article in the Edinburgh Evening News (Building Edinburgh's Future) a plan to commission a study of 12 priority sites believed to have potential for short-term transformation of which the former school is one. The article notes the difficulties development projects have in securing financing in the current economic climate. 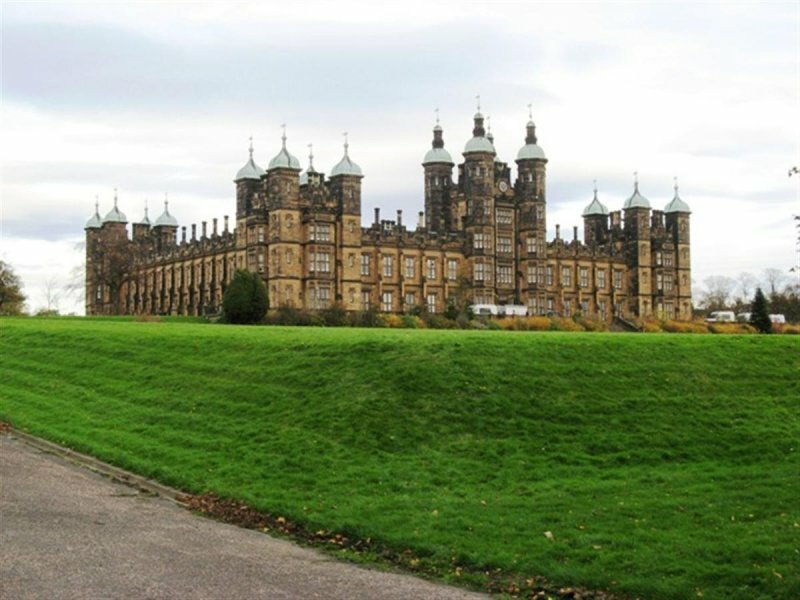 The study is to explore options for public sector intervention to unlock the development potential of the sites, a number of which already have planning permission in place. 18 February 2015: External inspection finds the building remains in much the same condition as seen previously. 25 February 2015: Local planners report Cala Homes and City & Country have announced a joint development of the former school site with City & Country managing the restoration of the main house. Applications for the development are anticipated to be lodged with Edinburgh City Council during 2015. 20 May 2015: Proposal of Application consultation for the conversion of the former school and gate lodges into residential dwellings, erection of new-build dwellings to the north of the site and construction of associated parking and landscaping has been carried out ref: 15/00090/PAN. 2 September 2015: Full Planning Permission and Listed Building Consent for the conversion of the former school into residential dwellings with associated new build to the north of the site are being sought ref: 15/03780/FUL & 15/03781/LBC. 13 January 2017: Local planners advise preparatory works, to support the residential conversion of the site, are underway. 20 February 2018: Redevelopment of the site into housing is underway. Moved to Restoration in Progress.